Multiple accidents at the Kara Isheri end of the Lagos_Ibadan express road that involved many vehicles has caused heavy traffic gridlock. 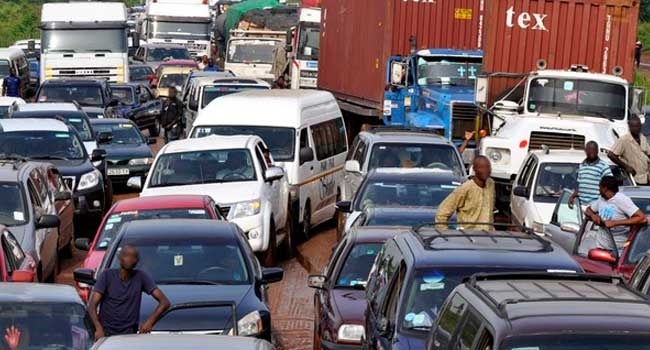 Vehicles heading in and out of Lagos have been battling with a heavy traffic gridlock on the Lagos-Ibadan Expressway all of Thursday morning. The traffic was caused multiple accidents at the Kara Isheri end of the road that involved many vehicles. Aledeh reports that the accident was caused by the failed brake of a trailer that resulted in the involvement of four other trailers, a Mazda bus and another Toyota Hiace bus belonging to a yet-to-be-identified school. Further investigation by Bounce News revealed that the situation was worse. An official of the Lagos State Emergency Management Agency (LASEMA) revealed that there were two different accident on opposite sides of the express. The one enroute Ibadan involved 16 vehicles and out of the 53 people involved, three died on the spot while 19 people were injured. The other accident involved a truck carrying plantain whose tyre ruptured on top speed. But thankfully only one person who was hanging on the truck was injured in that one. Nevertheless, the stationary truck has caused a bottleneck and compounded the traffic situation for Lagos-bound vehicles as well. Travellers inwards Ibadan have been stuck for hours with the traffic not making any progress while those who are headed to Lagos are also stuck in a heavy congestion of vehicles on the road due to the accident. Road users have been linking up to the Olowora-Kara route, thereby leading to heavy traffic presence as travellers remain frustrated at the situation of things.